PUPPIES: $2300.00 with a 2 year guarantee. English creme golden retriever puppies for sale. Your deposit of $300 will secure your puppy with the balance due of $2000.00 at the time of pick up or shipment. PLEASE CLICK ON THE YELLOW LINK ON THE RIGHT OF THIS PAGE ABOUT THE COST OF A PUPPY. We are thankful for these healthy puppies and we look forward to placing them in new loving homes. We have shipped puppies all over the lower 48. Costs are based on airlines costs. Usually around $400. At this time we prefer paypal with a 3% fee. $310.00. If you use paypal for a final payment you will also have to pay the additional fees. To use paypal for a final payment you would have to pay 48 hours in advance of pickup up to assure clearance. If for any reason a family wants to return a puppy there will be at least a 25% fee because of the renewed advertisement to sell the puppy and care we will have to do. We offer no obligation to take a puppy back and this will only be done at our discretion. This is a MUST READ for those considering purchasing a CHEAP puppy. GETTING A HEALTHY PUPPY WILL HELP YOU AVOID FUTURE EXPENSIVE VET BILLS. THIS SHOULD BE ON THE MIND OF ANYONE CONSIDERING PURCHASING A PUPPY. WE HAVE WORKED VERY HARD TO GET SOME OF THE BEST BLOODLINES AND HAVE HAD ALL OUR HEALTH CLEARANCES DONE BY A SPECIALIST IN EACH AREA. THIS GOES A LONG WAY WITH FAMILIES, WHO PURCHASE ONE OF OUR PUPPIES, TO HAVE A HEALTHY DOG. MOST EVERYONE IN THE ENGLISH GOLDEN BREEDING COMMUNITY KNOW THE NAMES OF ERINDERRY, DEWMIST, AND ASHBURY ANGEL HEART...OUR DOGS CAME FROM THESE LINES. WE LOVE OUR DOGS AND WE HOPE TO MAKE MANY FOLKS HAPPY WITH THE BEAUTIFUL, HEALTHY, HAPPY PETS WE CAN PROVIDE. GREAT PUPPY AT A GREAT PRICE. TO SECURE YOU POSITION ,IN THE PICK OF THE LITTER , PLEASE LET US KNOW YOU INTERESTED IN A PUPPY AND WE WILL BE GLAD TO TALK WITH YOU ABOUT OWNING ONE OF OUR PUPPIES. IF WE ALL AGREE THAT ONE OF THESE SPECIAL PUPPIES IS RIGHT FOR YOU WE WILL MAKE SURE THE TRANSITION OF THE PUPPY FROM OUR HOME TO YOURS IS A SMOOTH AS POSSIBLE. 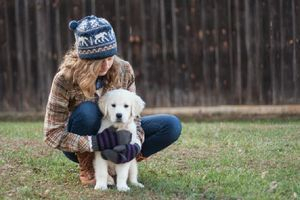 We love our Golden retrievers and we strive to provide puppies from healthy parents that will make great pets and hunting companions. WE RESERVE THE RIGHT TO KEEP ANY OF OUR PUPPIES FROM ANY LITTER FOR BREEDING PURPOSES OR TO TRADE WITH OTHERS OR SELL TO OTHERS. Full or Limited Registration:We rarely consider selling our puppies as breeders. We would only sell one as a breeder if the buyer is willing to get all the health clearances done...heart, hips, elbows and eyes and send us proof after two years. In addition we reserve the right to interview and have additional agreements signed before going forth with full registration. We reserve the right to decline any prospective buyer who wants to breed. We would require an additional payment depending on the lines being purchased.